Many times in project-based learning, it is called the “messy middle“. This is the time after the project has been launched, students identify need to knows, groups develop norms, and scaffolding has commenced. Now, this framework will focus on strategies team teachers (two teachers, two content areas, one class) can use to design a coherent approach to scaffolding student success, but can be used by any project-based learning facilitator. Now I know some team teachers will say, “we get along great, we don’t need to write it down” or “this is a waste of time, let’s just get started”. However, this process will provide a centralized reference point for when things get difficult. It becomes less about the other person’s opinion and more about the agreements each partner has committed to. Research shows that teenagers have very short attention spans. This data should inform the way we structure the scaffolding supports we offer students, but many times our actions go against the research. By approaching the “messy middle” through the lens of learning modalities instead of by activity, will allow team teachers (and all teachers) to adequately design scaffolds that fit the type of modality they wish students to engage in. Many times, team taught classes can have 50+ students in the room and that can be a daunting challenge for even two teachers to tackle. The following framework will help the teaching pair think through their approach to project design and implementation. Now you can create fancy names or themes to plug these modalities into, but for the time being, I will be straightforward about outlining the options. With that being said, I will not address both entry and exit opportunities for students, as those are valuable, but are exclusive of this conversation. The following five structures can help you better organize your approach to creating opportunities for student voice and choice, develop sustained inquiry over time, and assess both individual and group contributions to the project. This modality should only be used when necessary. This is when all students are engaged in the same activity at the same time. One pitfall we encounter with the whole group modality is teachers generally rely on frontal instruction or give unstructured work time. Here is a great piece from Rigorous PBL by Design author Michael McDowell that highlights the need for direct instruction in PBL, but warns against confusing it with frontal instruction. This modality is when one teacher takes half the class for an activity, the other teacher takes the other half, and then the groups switch. This modality allows for equal focus for each teacher to support all students. No again, let’s not get this confused with each teacher taking half to go lecture and then switch. The scaffolding activities in a split class setting can be of a wide variety. For example, one teacher might lead a workshop on citing resources, while the other teacher guides students editing their videos for the culminating event. Stations can be an effective way to organize multiple scaffolding activities into a single learning opportunity for students. In the station modality, 3-5 station activities are created for students to engage in moving forward with their need to knows to answer the driving question. Teachers can take on a variety of roles during stations. They might facilitate a station, serve as a coach for a scaffold, or rotate around the room from station to station. Here is a great post from educator, Catlin Tucker on shaking up the rotation station model. In this modality, targeted instruction or scaffolding is provided to a specific group of students for a very specific purpose. Breakout workshops can be optional or mandatory. For example, during the first benchmark of the project, team teachers might have identified 15 students that need additional support on applying ecosystems to the project context. One teacher stays with the larger group, while one teacher facilitates the breakout. Here is a great resource from MindTools with things to consider when planning a breakout workshop. Last, but not least is conferencing. In this modality again, one or both teachers might conference with individuals or groups to provide feedback. Conferencing is a great modality to use when groups are prototyping or applying their learning. Depending on if one or both teachers are conferencing will impact how you would want to design and what tools you give the rest of the groups to use to progress through the specific phase of the project. I know that this is not an exhaustive list of modalities to use when managing the “messy middle” of project-based learning. However, it is important for team teachers (and all teachers) to have a coherent structure to navigate what modality best serves the need to knows students have at that point in a project to successful engage and deepen the learning that occurs in a project. This one is pretty straight-forward. An entire project cycle commences with zero interaction to adults outside of the teacher. No bueno. Scenario-based connections can be powerful in done correctly. In this level of adult connections, community partners are used in a “mock” or “scenario” setting. For example, a teacher might have TV producers come show students how a TV show is made for their fake segment OR students might solve a real issue, but the community partner is used in a false reality. In both of these situations, the adult connection is still valuable, but not rooted in solving a real problem. This is the most traditional way we see adults brought into the classroom. Students might be learning about the legal process, so the teacher has a lawyer come in and present about the work that they do. Many times these guest speakers provide very valuable insights, but there is little or no applicable connection to the project work besides the topic covered. Another common way that we see community partners used in project-based learning is a a panelist or evaluator. In this level, the students work on the scope and sequence of the project and then the adult comes in on the final day(s) of the project. An example of this is where students might be drafting solutions for sustainability in the local watershed. A group of ecologist come in to hear presentations and give feedback on their ideas. This can be the most time consuming level of the adult connection spectrum. Here, community partners are co-creators of the project experience. They work hand-in-hand to design the driving question, problem, and scaffolds to drive the learning. An example of this could be that a local non-profit is looking for a documentary to be created covering a topic of interest. The teachers works with their executive director to design the project experience for students. In this level, adult connections are made continuously or periodically throughout the development of solutions. Adult connections serve as mentors, resources, and critical friends for project groups. For example, students are working in an Economics course to design start-ups. Throughout the course of the project each group has a mentor that comes every week to give them feedback on their design. The pinnacle of the adult connection continuum is solution seekers. These are businesses, organizations, non-profits, etc. that have an authentic problem that needs a solution. The project is guided by developing potential solutions and the adult connection actually implements a solution or mixture of solutions when complete. A solid example of this would be an engineering course working with the local downtown development organization to design the layout and function of a new public space. The organization then takes the student ideas and works with a design firm to finalize the plans to go to the city for approval. As you can see, there are a variety of ways to get started with building adult connections in a project-based environment. Obviously level one of the continuum is the only unacceptable one. Where do you fall in your current practices? Do you find yourself falling back to one level as a constant safety net? What does it take to build in more authentic adult connections to your projects? Create outreach templates, but don’t send mass emails. Personalize each outreach. Reach out to 5x the number of adults you are looking for (if you need 4, reach out to 20). You can always bank those additional connections for later. Be thoughtful to your community connections and their lives. There is no perfect formula, but consider how far out is too soon to reach out and how close to the start is too late. Does your school have a database of community partners and staff that are most closely associated with those partners? Start now. If I know that Mrs. Right has a connection at the Environmental Agency, I can connect with her before I reach out. Keep track of successful outreach efforts and unsuccessful. This will also help organize communication efforts and reduce the number of staff having multiple similar asks of the same partners. Think about how you can leverage digital connections. It’s not the same as in person, but just as valuable. Tools like Nepris can help with this. Also, Twitter had provided to be an invaluable tool In reaching out to the digital world. As a teacher, I was able to create a weekly Skype session with 5 staffers at the United Nations all because of one tweet. There is no rule that you can not have multiple adult connections or multiple levels of the continuum in the same project. For example, you might have local mental health workers come in and work with teams during the scaffolding phase, but then have professional psychologists evaluate the project. As well, you might design a project with a local company and then they come back in to evaluate the final products. There are a variety of creative ways to mix and match the adult connections you create for students. It takes time, but dip your toes in the water sooner than later! New Technology High School celebrated our 20th anniversary in 2016-2017. It cannot be without great energy, focus, and effort that a school as unique as ours can sustain and grow for two decades. At the heart of our work is our students. And at the heart of our students is our culture. Ask any visitor that has come over the past 20 years, and it will be one of the first things they point to and one of the first things our staff and students are willing to open up about. Our schools culture is built upon trust, respect, and responsibility. Nearly 200 schools in the New Tech Network that have come since the opening of New Tech High have built their pillars on this same foundation. However, to truly transform culture, we must move from KNOWING what our culture is to manifesting how we LIVE our culture. For example, a simple Google search can tell me that respect means to have a feeling of deep admiration for someone or something elicited by their abilities, qualities, or achievements. But what does that look like in action? How do I interact with someone that I might feel doesn’t deserve my respect? Being able to articulate how we know our culture into actionable actualizations of it is key. As well as this, to truly transform culture, it is important that I empower people to have the autonomy to act. What if one person breaks my trust? Do I create a rule that the other 99.9% must follow now? Not putting up barriers to living out the culture is important to create opportunities for cultural growth to happen. Honor the Strengths of Your Existing Culture – not resting on your laurels doesn’t mean you throw out what has been working. It is important to highlight the core components of your culture, the people that exemplify it, and create opportunities to deepen it. Match Strategy and Culture – one of the trickiest things to do when not resting on your laurels is making sure the strategies you are implementing will produce the cultural outcomes you desire. Change is hard, but as time goes by, it might mean that strategies and structures need to evolve with it. There is no end point in school culture. There is no end point in innovation. There is no end point in creating amazing educational experiences. It is hard work. But when done right, a school can go from resting on what has worked in the past to transforming it before toxicity can creep in. Is everyone in your organization culturally aligned? How do you know? School Culture Rewired by Todd Whitaker and Steve Gruenert has some powerful tools to help you measure your school’s cultural health. Why is this important? Many times, the norms and policies our schools have in place, classroom expectations set out by teachers, or individual behaviors and beliefs get in the way of transforming culture. One good example of this was our school’s cell phone policy. We promoted a culture of openness, student ownership, and modeled after the workplace. However, our cell phone policy was punitive and counterproductive. In working with various stakeholders, we transformed the policy to mirror the cultural outcomes we desire. Was it an easy transition? Did everyone buy-in? Of course not. However, it is vital that policies, mindsets, and beliefs at the school, class, and individual level are aligned to those overarching cultural outcomes for a culture to thrive. As the world transforms around us, it is vital that we are constantly examining, evaluating, and protecting the culture we have created. Recently in re:Work, a group from Google examined the role psychological safety plays when people work together. Continuing to grow our culture where EVERY adult and student feels comfortable learning from failure, sharing ideas, and innovating off of one another must be at the forefront of our work. Our most recent California Healthy Kids Survey let us know that we have a lot of work still to do. Many of our students experience depression, deal with or know someone that deals with personal substance issues, and for some, “school” is the only stable part of their lives. It is imperative that we help make the transition for acknowledging that our culture is unique to creating new avenues for people to live out the transformation that is possible. I just got done reading, “The Enemies of Excellence”, by Greg Salciccioli. Salciccioli takes a deeper look at the risks we face when on the pursuit to the best us we can be. After reading the book, it made me wonder what, as educator’s, our enemies of excellence are. Saciccioli highlights SEVEN enemies, I will apply each one to our effort to provide the best learning opportunities for students we can. Pride can be a dangerous thing. When reflecting on this enemy, it makes me think also about Jim Collin’s book, “Good to Great”. So many times as educators, we are okay with good, because it works. Being content in schools and classrooms can be dangerous and lead to stagnation. Putting our ego and pride to the side and striving to be an organism of continuous improvement is a must for all educators. How many times as educators have we been unhappy with something, take 45 minutes of our prep to vent to someone about it, and then realize we could have actually completed the task we were unhappy with in that time. Time is one of the most scarce commodities we have as educators, but also the one we misuse the most. I encourage all educators to have someone audit the work they are doing. Let them poke holes in your work and help you find ways to be more effective and efficient with the time you do have. Identifying our bad habits is one thing, putting systems in place to fix them is another. So many educators have positive intentions with the work they do, but our bad habits get in the way of our desired outcomes. As a principal, I have a strong desire to be in the classroom more. However, I have a bad habit of letting other tasks creep into the time I allot for it. Until I do something to fix it, I only have myself to blame. What do you as an educator indulge in? What is it that you feel entitled to? Our view of hard work and dedication can many times drive us to feel like we deserve something in return. Context drives this a lot. I am blessed to work in a state of the art school that implements wall-to-wall project-based learning. It is easy to get frustrated when a kid doesn’t bring their device on a certain day. When I step back and reflect, I have friends that work in schools that feel blessed when they get a day each semester in the computer lab. Perspective is killer. Back to that intentions thing. Educators are some of the most passionate people you will meet. However, many times our emotions and opinions get in the way of moving towards a collective efficacy with our peers. Also, how many times do we get frustrated with that kid that just “doesn’t get it”. Broken relationships can fracture any interaction we have with our fellow educators or students. What are we doing to rebuild and repair these relationships even when we don’t think we are at fault? Silo’s only create more silo’s. Even in the era of one-room schoolhouses, the teacher couldn’t do it all by themselves. Professional learning communities are hard work and take time and energy. But working in a collaborative environment gives us the opportunity to receive feedback, implement changes, and analyze results. Sometimes it feels easier to shut your door and do your own thing. But in the long run, you are only hurting yourself. The Observe Me hashtag and movement has been an awesome way to invite feedback and not live in isolation. The hardest of all the enemies of excellence. How do we not get in our own way as educators? I remember as a classroom teacher, sometimes thinking, “That lesson design was really good. Only if the students would have done a better job with _______.” Externalizing the enemy is the easier out. What if I would have said, “That lesson design was really good. How could I have tweaked it to reach more students on ___________?” We sometimes can trick ourselves into doing something or not doing something for a variety of factors. What does looking in the mirror look like when making that decision? When we think about the enemies of excellence in education, many times we point to standardized testing, legislation, lack of resources, etc., etc. What if we flipped that conversation on its head and began thinking about what personally is within our sphere of influence that we can control. What are the enemies to our own excellence and what are the enemies to our school’s excellence? One of the toughest parts of true innovation in education is school itself. Many humans love to learn, but hate the idea of school. The concept of school is to promote and foster this love in a purposeful manner, but many times it can get lost in conformity and hoops. There is some great thoughts out there about “deschooling” education. Mindshift has a great article from my friend, Adam Holman, titled “How ‘Deprogramming’ Kids From How to ‘Do School’ Could Improve Learning“. In the article, Adam shares a revealing comment from a student, “For the first time in my life I am trying to learn everything instead of just get a 70 [percent]”. That is powerful and the hurdle from not seeing school as something that is done to us or a building we go to must shift for change to happen. We must ask ourselves always, “what does it mean to be accountable, what are we accountable for and who are we accountable to?” We know that the fear of accountability can cripple innovation in education. Both schools and educators alike are forced to constantly think about performance and meeting standards set out for them. But should this stop shifting the way we think about education? We all know amazing examples of public schools and teachers that are both highly innovative AND perform well on accountability measures. We also must admit, that we know, accountability is always a moving target. And maybe that isn’t quite so bad. Accountability can easily become a scapegoat in stopping innovative practices from spreading. Teachers feel so tied to meet the standards in front of them or schools feel like they must do everything they can to focus on improving state testing metrics. Factors such as tenure and seniority can also play a devious role in teachers outlook on implementing innovative teaching practices. However, data shows, that even the teachers that fail to meet these “accountability” measures rarely get dismissed. The National Center for Education Statistics have released numbers that show less than 2% of tenured teachers get dismissed for performance. As well, the American Enterprise Institute looked at teacher dismissal in New York. They found that from 1997 to 2007, only 12 New York City teachers were let go for incompetent teaching. The point is that accountability is important. But vary rarely will your school get shutdown or will a teacher get fired. So why not try something new and outside the box? This might be my favorite one. Still being relatively fresh to California, I was puzzled by the A-G requirements from the University of California for high schoolers. Now I know in a state the size of California, it is important to have some metrics in place for what high school students need, but I was blown away by the influence it has over what happens in high schools. As well as this, I recently overheard a conversation from one of my high school students about a college class they were taking. The professor had stated to the whole class that, “high school students should be worried”, “he didn’t understand why they were allowed to take his class anyways”, and “they would probably fail because high school is easy and college is hard”. It was hard for me to not chime in, but I wanted to find him and ask him who anointed him the gatekeeper of all education. The point is, these are just two small examples of how high school must answer to higher education. Data from the National Student Clearinghouse shows that on average 30% of students that enroll at 4-year institutions don’t finish…at ANY institution. Whether it be the SAT & ACT or even perceived elitism, higher education has a stranglehold on what happens in high school, many times without the accountability measures listed previously. Preparing students for college is a vital component of a high school’s role; sometimes I just wonder why the institutes of higher ed have so much influence on us and it seems like the many innovative high schools out there have so little influence on their practices. Lastly, being human is tough. The energy, empathy, collaboration, and time necessary to be innovative can be draining. Hell doing a crappy job can be even more draining! We must recognize that as humans, we put many limits on ourselves. We are confined to the practices we know, restricted to our opinions and beliefs, and resistant to change. As we look at innovation in education, many times it is all just one in the same. Taking the same box and painting it a different color, moving from a 7 period day to a 6 period day, or using the same ole sustained silent reading everyday are just part of those limits. HOWEVER, we have seen and will continue to see we are capable of so much more. When we remove the barriers to entry, we are able to see clearly and re-imagine the role that schools and education play in our communities. In my next post, I will explore some potential avenues in which I believe innovation can help us re-imagine education, not just repackage it. 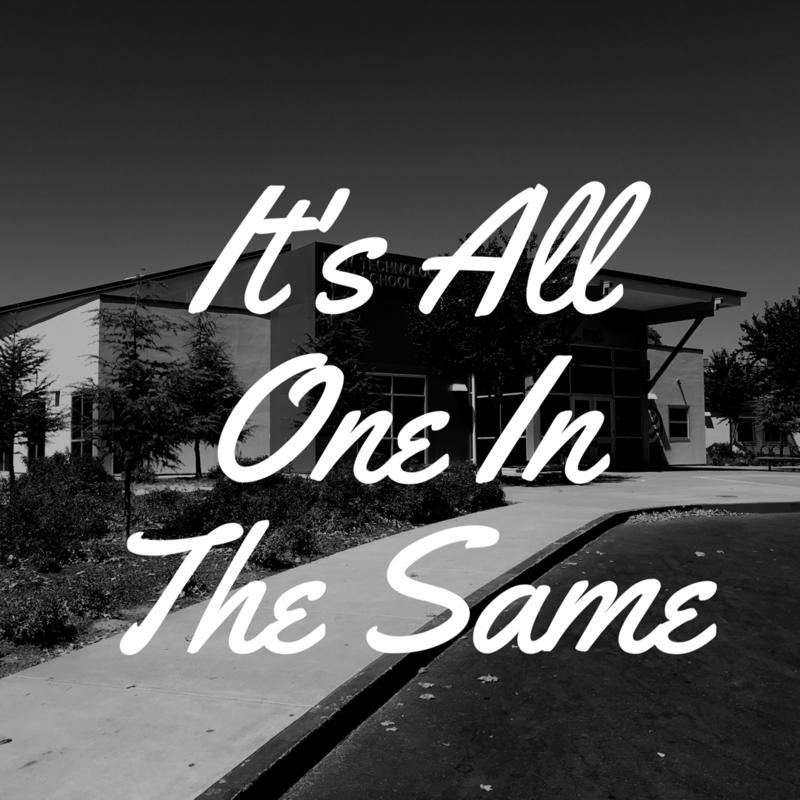 I am not saying throw the baby out with the bathwater, but I am saying lets not get stuck in this “it’s just all one in the same” and really think about what can be next for school, teaching, and learning.